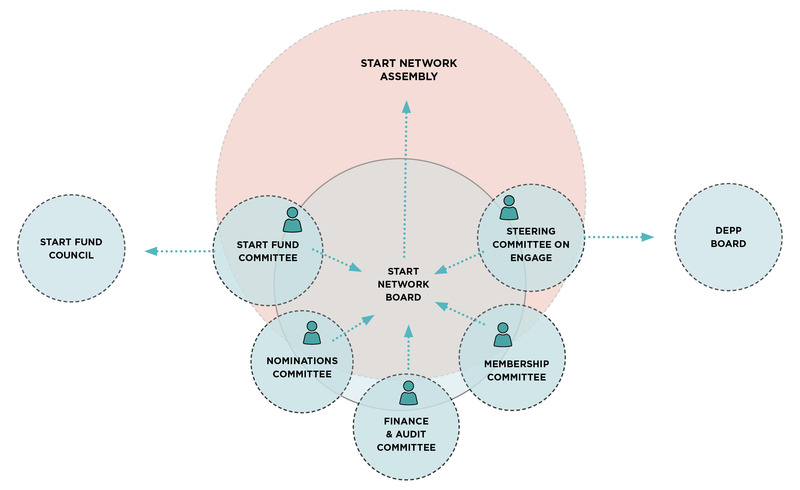 The Assembly, made up of representatives from all Start members, sets the Network’s strategic direction and acts as a sounding board that informs the Network’s evolution. Its role is primarily advisory in nature, but the Assembly retains three important governance responsibilities: approving new members to the Network; approving the election of new Trustees to the Board, and; overseeing the Board’s performance. Click to see who our Assembly members are. Oversees the sub-committees and team performance; provides strategic steer; approves the annual business plan and budget; considers new programmes and services. The Board has delegated authority to make decisions on behalf of the Assembly, but takes its steer from and is accountable to the membership. See who is on the Board of Trustees. There are five sub-committees to the Board with delegated decision-making authorities. Advises the Board and Start team on financial operations, audit and risk management. The responsibilities of the Committee include having oversight on all financial matters, including the annual accounts, budgeting and financial management, as well as identifying and understanding all financial and operational risks to the Start Network. The Committee also has a key role in audit planning and agreeing the scope of both internal and external auditors’ work. Oversees the selection and onboarding of new members, the membership policy and annual membership contributions. Responsibilities include receiving applications to membership and making recommendations the Board of Trustees, as well as overseeing the due diligence process. The Committee also oversees the development of the Network’s membership policy, and recommends the annual membership contribution. Responsible for appointing individuals to the Board and ensuring a good balance of skills are held by the Trustees. Responsibilities include recommending the skills and experience that should be sought in the nomination and election of Trustees, as well as leading the election process when there are vacancies that need to be filled. This process involves confirming the appointment brief for the Trustee positions; conducting searches for appropriate individuals; shortlisting and interviewing candidates; and making a recommendation to the Board on appointments. Also known as the SConE (Steering Committee on Engage), it oversees the governance and strategic direction of the Start Engage work stream. Responsibilities include developing, implementing and reviewing the Start Engage strategy; amplifying learning from programmatic evidence and influencing policy debates; oversight of the DEPP (Disasters and Emergencies Preparedness Programme); and strategic engagement with donors and other stakeholders. Oversees the management, operation and strategy of the Start Fund. Strategically, the Committee provides advice and input to the Board, particularly around the principles and the processes for decision-making. The Committee has delegated authority from the Board and, through decision-making subsets called ‘rotas’, makes decisions on funding allocations, stewards the progression of the project selection procedures, and participates in associated learning and evaluation peer reviews. The Start Fund committee is made up of all Start Network members. Within the Start Engage stream of work, the DEPP Board is responsible for reviewing proposals and approving programmes for inclusion in the DEPP (Disaster Emergency Preparedness Programme) portfolio, and for ensuring the strategic direction and effective delivery of these programmes. The Start Fund Council brings together all Start Fund donors to review their investment in the Fund. The Council has have direct governance oversight over the risk management of the Start Fund, the policy of which the Council reviews and endorses on an annual basis.